The device comes nicely packaged with the obligatory DC power pack, an infrared remote (with batteries) and two A/V cables – one for composite video and one for component video. The device does not come with an Ethernet, TOSLINK or HDMI cables, so you need to purchase these separately. Its also worth noting that even though this device comes from one of the world’s biggest hard drive manufacturers, it does not include a hard drive – you have to provide that. Western Digital must have figured people would naturally buy one of their hard drives when purchasing this unit. But given the addition of the Ethernet port, this is not strictly necessary. Maybe WD learned from their mistake, as the replacement model of this device (WDTV live Hub) does come with a 1TB drive built in (and costs three times as much as a result). On unpacking you realise how small this device really is. It’s tiny – about the size of two portable 2.5 inch drives stacked on each other. On the back there is a myriad of ports – USB 2.0, HDMI 1.3, Toslink optical audio, Ethernet, Composite A/V and component A/V. There is also another USB 2.0 port on the left side. So it’s possible to add two local drives if you want. For best results use the HDMI and Toslink connections if you can. The quality improvement is worth the extra few dollars for the additional cables. There is no user interface on the device – not even a power button. Just two white LEDs on the front panel – one for power and one for indicating activity on the USB ports. So you need to use the remote to turn it on. The first cold boot took a while (~20 seconds) but it immediately recognised my network and quickly detected an updated firmware available for download. After confirming I wanted to upgrade, the device just does the upgrade. Subsequent boots are “warm boots” and happen in just a few seconds. All user interaction is through the attached video screen. Think of a DVD player with no front panel buttons. The user interface is basic and functional. 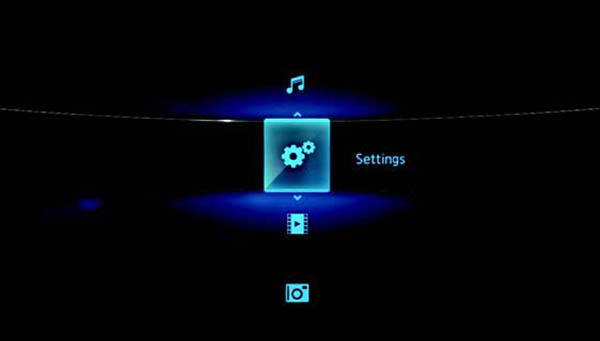 With the remote, you select which media type (music, video, photo) you want to play and then select the source (local drive, network share or media server). As I have network shares and a media server (Asset) configured on my network, I have not tested the local drive option. Selecting Network Share shows a list of servers on your LAN to choose from. Once you have selected a server, you will be prompted for a username and password to access that server. You enter both through an on-screen keyboard – like XBOX 360s. It’s tedious but you can ask the device to remember the username and password so thankfully you only have to do this once. After connecting to the share, you can traverse the tree and select the media you want to play. One drawback I noticed is the device does not create a media library from your file shares so you are forced to select your files by folder and file name and not the details stored in meta tags. Apparently this feature does exist but only works for locally attached drives. The device is renowned for supporting a huge list of video and audio formats – including FLAC audio and MKV video. Apparently it will even play ripped DVD ISO files (complete with menus) but I am yet to try this myself. Playing FLAC audio produces a clean bit perfect 44.1KHz PCM signal on the digital optical port. So your FLAC ripped CDs sound exactly as they would if you were playing the CD locally. Audio nirvana. If you don’t want to use shares, you can use a uPnP AV server like Asset. The advantage of this is the server will organise your music however you want it (e.g. by title, artist, year, genre etc) which is important if your collection is large. Asset passes the FLAC files directly to the device untouched, keeping the quality intact. Videos work well. I have a collection of XVID encoded movies with AC3 5.1 audio tracks. All played well over my 100Mbps LAN. M4v encoded videos also worked fine. You can also view photos stored locally or on a share (and while listening to music). USB thumb drives are automatically detected and immediately play any media stored on them. Very handy when friends come round and want to show you photos or a video. The latest firmware supports YouTube, Flickr and Pandora. For those in Australia you will have to use a US based VPN to access Pandora but YouTube and Flickr seem to work OK.
You can configure the device and its attached drives to appear as a share on your network, so it’s possible to copy and sync files stored on the local drive remotely via your network just like any other file share. Also, the WDTVLive comes with a simple file manager which you can use to copy files down from your shares onto the local drive(s). The WDTVLive has been hacked. There is a thriving homebrew community building and supporting custom firmware and various plugins. I have re-flashed mine and am running one of B-Rads custom images. B-Rad and his team have managed to add a web interface, telnet, ssh and all sorts of goodies to this little device. Someone else has built on this and has developed a wifi based remote control for Android. So now I can change tracks or volume from my phone and I don’t have to be in line of sight… now that is cool! I still use my XBOX 360 as a Media Center Extender for watching live and recorded TV – but its days of being a media player are over. Music and video is now truly the sole domain of the WDTVLive. If only the WDTVLive could record and play digital TV, it would be a complete replacement for the XBOX 360 and Microsoft media center. Sadly, the WDTVLive has been discontinued and superseded with the more expensive WDTV Live Hub so retailers are dumping them very cheaply. In Australia that means around $100. But you will need to be quick.